Is Justice League (2017) good? Don't ask Rotten Tomatoes. Love it or hate it Rotten Tomatoes has been a dominant force in the movie industry. Think how many times you've seen movie posters or commercials touting it's highest rating of "Certified Fresh". But for all the love it's spelled doom for some movies as a bad rating will be yelled by every movie review or entertainment news site. Recently the company has been trying to aggressively position itself as an entertainment site and not just a place to see a rotten tomato. One of the ways they're doing this is with their Facebook video series See It/Skip It. So they've decided to launch an official "reveal" of the Rotten Tomatoes score Thursday, just after the stroke of midnight. Now it's possible that all of this is perfectly innocuous and just an example of a site trying to monetize its key benefit. But it also leaves fans in a quandary. If you're wondering if you should buy an advance movie ticket you're left in the lurch. Rotten Tomatoes is like the Wolverine of entertainment aggregator sites. They're the best at what they do. And what they do isn't always very nice. But have no fear. There are actually quite a few alternatives to Rotten Tomatoes and I'll list them for your reading pleasure and rank them by ease and effectiveness. Since it launched in 1998 by Senh Duong it's become a fixture in marketing and a thorn in the side of movie companies. The site takes selected critical reviews, gives them a love it or hate it score and tallies the average. But there's been a shift. In January 2010 the company that owned RT, Flixster, was bought by Warner Bros. In February 2016 the two sites were bought by Comcast's Fandango like a delicious Oreo cookie ready to gobble up their hated enemy and dunk it in the milk of commercialization. You see Fandango sells movie tickets and they sell fewer tickets when people see an RT score telling them the movie is hot trash. If you're not in a rush and don't mind waiting, just follow See It/Skip It and wait for the official score from RottenTomatoes. but if you're planning your weekend or can't handle the suspense of the biggest movie of the year there are other options. While Rotten Tomatoes don't show any critical reviews until the launch it's not hard to do a Google search and guess from the title what the reviewer thinks. 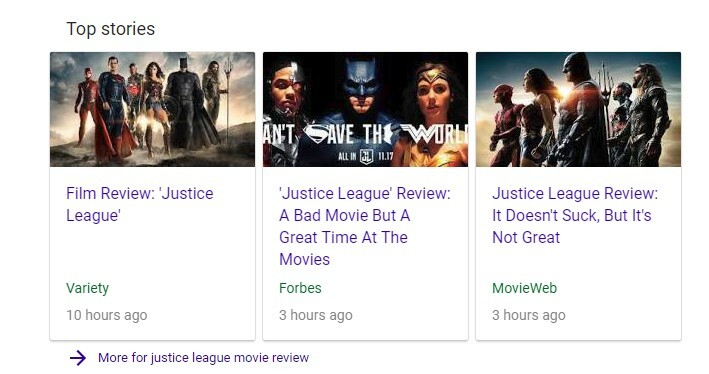 Titles like Vanity Fair's "Justice League Is a Big, Ugly Mess" isn't too subtle, but I'm going to guess "Rotten". ComicBook.com's "'Justice League' Review: The Heroes We've Been Waiting For Arrive" is clearly in the Fresh category. But titles like Forbe's "A Bad Movie But A Great Time At The Movies" are a little harder to guess at. If you have the time you can go through all the reviews and compile your own score. Of course, that means a lot of reading. If you're in the TL;DR (Too Long; Didn't Read) crowd you can go another route. Mashable did their own unofficial ranking and came up with the score of 44% which isn't too bad. Other sites take the critical consensus and give it their own summary in articles like Entertainment Weekly's "Justice League reviews rundown: Critics slam 'embarrassing' sequel" or ComicBook.com's "'Justice League' Review Roundup". Not too bad, but still not a scientific consensus. 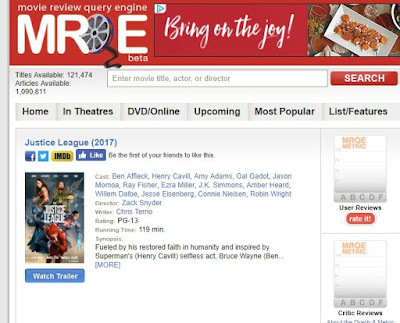 Since 1993, The Movie Review Query Engine (MRQE) has been managed by Stewart Clamen. It's way behind the curve though. They list the reviews and a few scores but don't have an MRQE metric yet. It lists five reviews and two of them are 2.5/4. Not great. If you're looking for a critical consensus it's not going to help, but like a fine wine, it'll get better in time. By comparison, Batman v Superman got a 50% score compared to RT's 27%. So the site isn't close to the RT score. Letterboxd is entirely different from the others. Unlike RT it's a social networking site. So it relies less on professional reviews and more on its user base. The site was launched in 2011 and went into public beta five years ago. 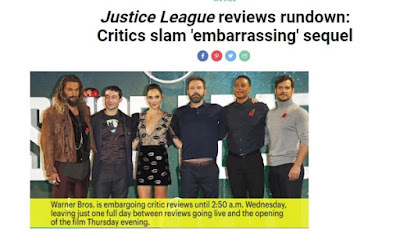 It's far from perfect, but if you don't trust professional movie reviewers it's an option. By comparison, Batman v Superman got a 2.6 rating. I don't have any idea how this ranking works because it's not clear. Is 2.5 good or bad? Is it 2.5 out of 5 or 10? Why does Thor: Ragnarok get a 3.8? Is that good or bad? No idea. It's like if your teacher writes a Q on your report card. What does that mean? Is it good or bad? Maybe it's a metaphoric way of saying you have to find your own path. Namaste. Personally before Rotten Tomatoes became the dominant place for reviews I preferred Metacritic. Metacritic was created by Jason Dietz, Marc Doyle, and Julie Doyle Roberts in 1999. Instead of just a blanket score, the site gives a weighted average based on the score given by reviewers. Instead of just five loved it and five hated it says 10 reviewers give the movie an average score of 65%. It's more nuanced. Right now they say the movie gets a 51 which means "Mixed or Average" reviews. So, if you're looking for a critical consensus before the RottenTomatoes reveal then head to Metacritic. It's the most effective and easiest of all the options. Or you could just go in cold without reading reviews. It's your money. Spend it however you want. How are you deciding whether to see Justice League or not?